The The hardiest decision, so far, planning my backcountry hike has been the the decision of what to sleep in. Size, weight, cost, humidity, and practically have all played into my current position, as I don't dare say decision as I may change my mind. 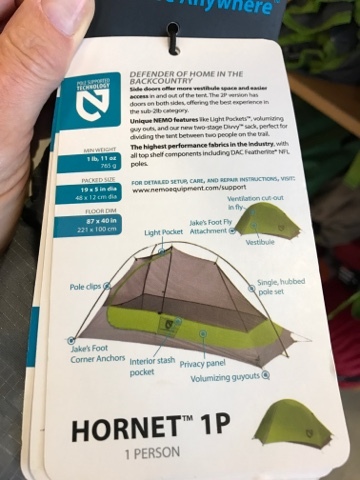 Since starting to plan my backcountry hike I have been moving my thoughts from sleeping in a hammock, bivy sac, single person tent, I carry in the Prius, to buying a new lightweight single person tent. Last year I carried a two person dome tent and never used it. It wasn't that expensive and it was easy to set up, but it wasn't lightweight for backpacking. It just took up extra space as I just never used it. I replaced this two person tent for my 2017 travels with this one person pup tent in the picture above. It is simple as the top shell is one piece with the ground cover connected at the bottom. The end opens and has a screen with rainfly. It is simple and doesn't need a ground fly. It uses stakes and a pole and guide on each end. This one person (1P) tent i currently own and carry is not a bad choice for size but a bit heavy, at 3 lb. 5 oz. 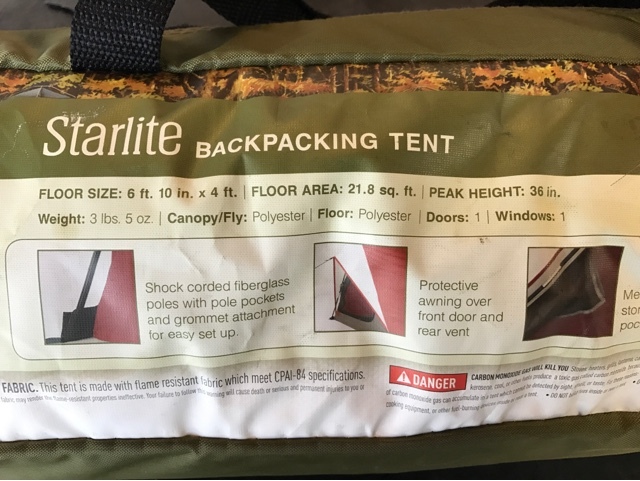 In addition to looking at new light weight 1P tents, I have looked at ultralight bivy sacs. They are just bigger than a mummy bag and mummy mattress that fit in them. They usually utilize a hoop that bows the top up off your head. I have a friend who has one like what REI sells above and weighs in at 1 lb. 2 oz. I considered a bivy sac but I have a concern about moisture and related condensation and my sleeping bag getting wet. Based on my pack's final weight I still may get a bivy sac as it is relatively cost effective and low weight. If the weather is not raining I could leave the rain fly open and have the bug screen dissipate most of the moisture. 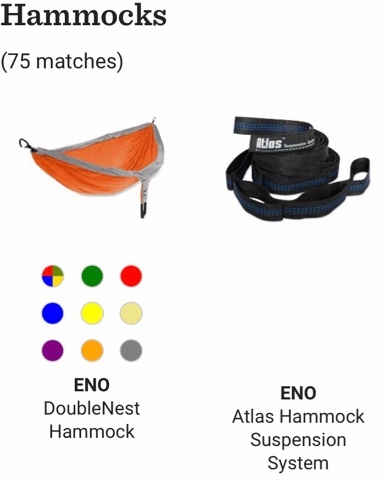 I was given a lightweight hammock and suspension system for my 2017 Travels like the items sold by REI above. Where I'm going on my backcountry hike there may be trees I can connect the hammock to, but I am assigned a campsite and there is no guarantee I will find the proper tree placement. I would also need to bring a rain fly in case if rain and I have noted that I should plan on some bugs so a bug net wil he needed. Without proof positive to have the trees of sufficient size and placement, this choice doesn't rank high as my current pup tent or bivy sac. My last choice is to buy a lighter weight 1P tent like this 1P sold by REI above. At 1 lb. 11 oz. this lightweight tent is 1 lb. 5 oz. lighter than my tent. The problem is that to get this weight reduction it will come at a large cost of over $300.00. As the sales guy at REI said to me "The lighter the equipment the lighter the wallet". The other thing to remember is that a bottom footprint (tarp) is recommended and not part of the tent weight. Usually the rain fly is part of the tent weight, but when buying I would need to validate all the pieces and weight. 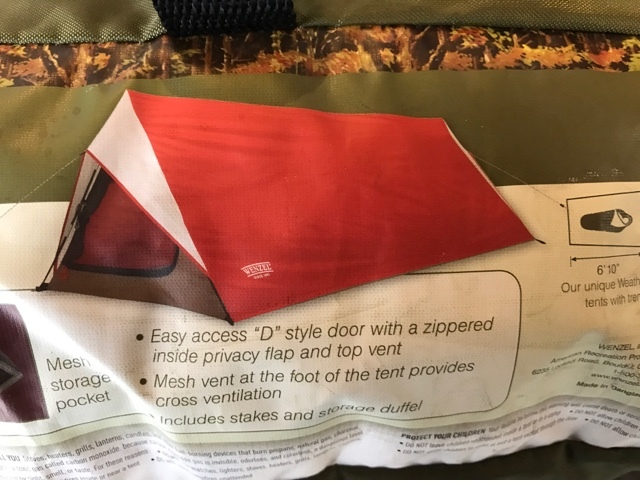 Another friend uses a tent that uses 2 hiking poles. If you use two poles to hike it would save carrying tent poles. I only use 1 hiking pole choosing to have one hand free and I switch arms. 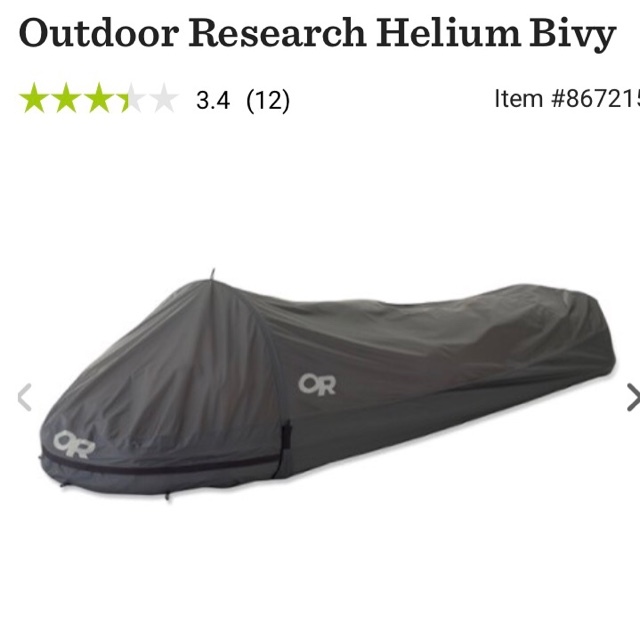 The $169.00 bivy sac at about the same weight as the lightweight tent would be a good choice but I'm a bit concerned about the sleeping bag rubbing on the bivy sac and possibly getting wet. This is less of an issue if it doesn't rain and I can leave the screen open. Another negative is that I have to leave my backpack outside. So far my 1P tent seems to be the best choice, although as I'm writing this I continue to add weight to my backpack. I may be back looking at this decision as I have 3 weeks left to change my mind. - Curr. 1P Tent 3 lb. 5 oz.